How to choose? 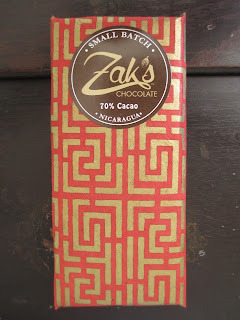 For my first look at the chocolate bars from Zak's Chocolate, I knew I wanted their Guatemala Lachua since it just won Silver at the International Chocolate Awards this year, but I also wanted to try one more along with that. What's nice is that, when you visit their shop, on the shelf with all the chocolate bars are small bowls with samples of each chocolate. So if you are just stopping in for one bar, you have the chance to choose the one you like best to buy (sometimes when I'm visiting a chocolate shop in another city/state, I have to try and choose which bars I think I'll like best because I can't really buy them all, so it's nice to not have to guess). I didn't really need to try any samples here, though: I'm close enough to go back and, over time, buy each bar to review on its own. I did, however, try a piece of the Nicaragua; the flavor notes of "brown sugar, vanilla" drew me in. So this is the bar that I'll be focusing on today. It comes in at the standard cocoa content of 70%, and the cocoa is specifically labeled as Nicaraguan Matagalpa cacao. Inside the chocolate is just cocoa, cane sugar, and a some extra cocoa butter--it's all organic and the cocoa is ethically sourced. Zak's Chocolate, if I haven't mentioned before, also presses their own cocoa butter. The style of the packaging here is handmade and handcrafted in the honest and best sense of the words. Pretty paper with sticker labels on the front and back is folded in a specific way and reveals underneath light blue foil (which the camera couldn't quite pick up). It's a cool contrast to the usual silver or gold foil wrappings. Fifteen rectangles make up the chocolate bar; they each feature a diamond shape in the middle to add that small touch of visual interest. There is a deep cocoa aroma to the chocolate. This is also the taste that comes first: simply a deep chocolate flavor. Then it gets what I want to call a toasted vanilla flavor. I use this phrase because the flavor isn't quite what I'd call sweet (like what I would normally think of for vanilla or brown sugar notes) because it does have a certain twang to it, but it still feels in the realm of sweet flavor. Not that I would call this sweet chocolate; it just has a sweet flavor in it (neither is this bitter or extremely dark chocolate). Sometimes after this I get a syrupy flavor that almost tastes alcoholic to me--but in the sense of vanilla extract, not liquor. This flavor goes somewhat along with that twang that I mentioned, a twang that isn't quite bitter or acidic but is simply an edge to the flavor. Depending on the time of day that I eat it, I find that I either get more of the sweeter flavor or more of the twangy flavor; I prefer the sweeter moments. The chocolate becomes more tender towards the end. As it finishes, I find myself thinking of woods in autumn and pathways through brown and yellow trees. The meeting point between warm and cool. A wool sweater with a soft gust of wind. So this is chocolate that takes you on a journey. As I go along and try more from Zak's Chocolate, I'll try and compare and contrast the different bars to give a sense of what each one offers, as far as what types of flavor notes they contain. For now, though, it is sufficient to say that this is not just happy, small batch chocolate; it is quality artisan chocolate.